Today I had my first ever Chinese wrong number call. The lady went on for a minute in Cantonese before I was able to get a word in edgewise. She hung up on me, and then called me back a minute later to tell me (in English) that she had the wrong number. No kidding. Is calling back a second time to state the obvious polite or ridiculous? It stopped raining today, yay, so we headed to Wan Chai on Hong Kong Island to meander around. Colin made friends with a Filipino family on the tram from Central to Wan Chai. The Grandpa was really excited that we were from Canada because he has family in Calgary. As soon as we sat down with them the daugher-in-law insisted that we get our picture taken with the Grandpa. So funny. I wish I had gotten a picture of them, their 18 month old boy was adorable. 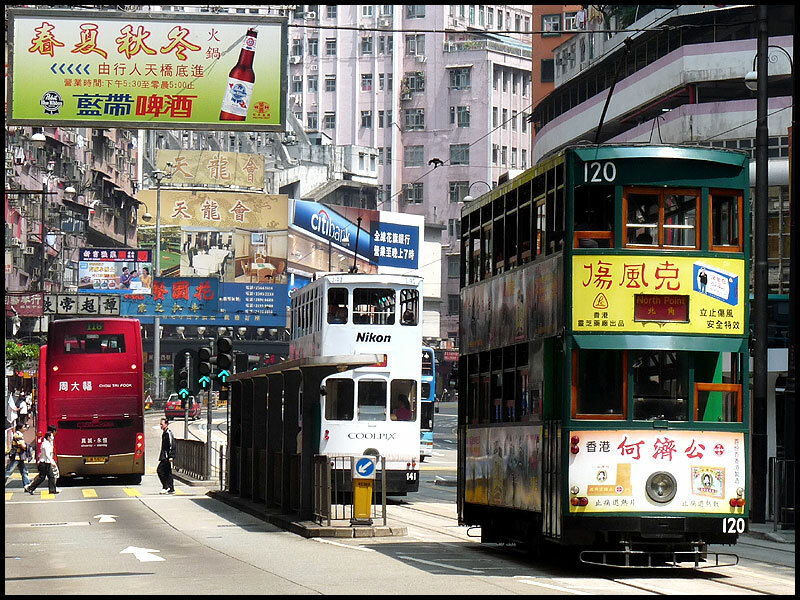 Instead, here is a picture of an HK tram. 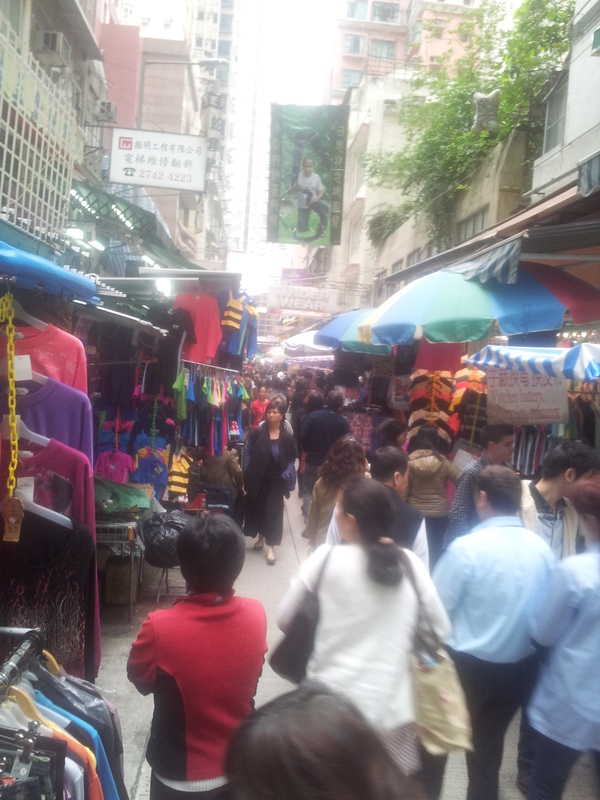 We got off the tram at Wan Chai market and walked around there for a bit. 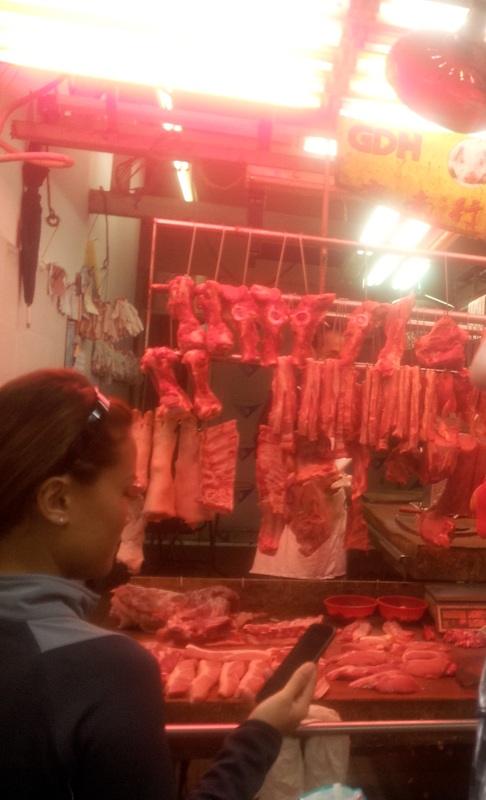 There is everything from baby clothes to raw meat in this market, so fun to walk around. At one point Colin got way behind us but he was easy to find because he was the tallest in the crowd, and he isn’t even 6 foot. We were feeling peckish at this time (despite the chicken feet and cow’s liver market stall) so we popped into a teeny Chinese restaurant off the street. Luckily they had an English menu. 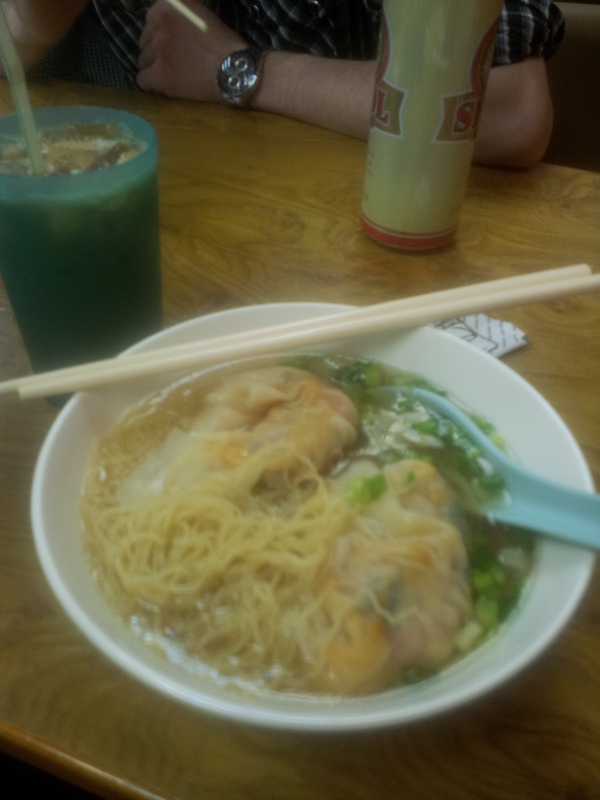 It was all egg noodle soups with different meats in them. None of us were feeling adventurous enough to try the pig intestine soup, so Colin got pork balls, Mom got flank steak (which turned out to be less flank and more fat and gristle) and I took a shot in the dark at ‘Fung Shing Dumpling’ which turned out to be shrimp and mussel dumplings. We were maybe a little overly optimistic in our hopes for the food. This was no Canadian-Chinese food, it was Chinese-Chinese and a little too ‘authentic’ for our tastes. The price was right though, less than $10 Canadian for lunch for the 3 of us, cheaper than our coffee shop order later in the day.